With the observation of the birth of Christianity just days away I thought we’d take a look back at one of our first “dilemmas”. It’s always interested me why the Mormon Church would want to be included in the circle of Christianity when they’ve tried for years to separate themselves from it. Here’s what we wrote about it. 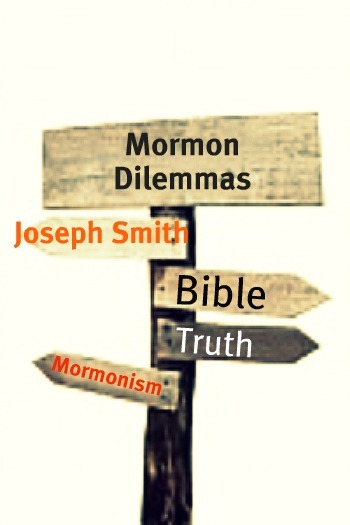 This dilemma will focus on the so-called total apostasy the LDS Church claims took place within the body of Christ. The entire structure of the Church rests on this particular claim so it’s worth our while to take a look at it. The Encyclopedia of Mormonism says on pg. 57; “Joseph Smith in his first vision (1820) was told by God that all existing churches had gone astray, both in their teachings and in their practice, although they had “a form of godliness” (JS-H 1:18-19). Thus it was necessary for a “restoration” of the gospel to take place.” The dilemma with this theory comes in light of what D&C 7:1-8 says. It states that at least one of the original twelve apostles never died. Now if they never died then how did a complete apostasy took place? Why couldn’t they have made sure the priesthood was handed down to the Christians instead of waiting for it to get to such a degraded state? The Church also claims that Peter and James came back as resurrected beings to Joseph to confer the priesthood on to Joseph Smith and Oliver Cowdery. Why did these fellows take 1,800 years to take action? D&C 7 says that John didn’t die so that he could live forever and “save souls”…was this salvation he offered part of the great whore of Babylon? It poses a dilemma when you call people names yet want to be “one of them”.